Although there is not a set time for each appointment, I will work on your horse for as long is necessary, a guide for what timing to allow is one and a half hours for initial consult and one hour for follow up consults. Initial consults can take longer as it is the first time that I have seen your horse/s and I need to gather history and information on your horse and make a full assessment to determine areas that may need extra attention. If you have a massage booked please keep your horse clean, dry and warm prior to my arrival, I can not massage a wet horse as the massage is not effective and we will not see the desired response. I understand horses are horses and they will always have some form of mud/dirty on them and this is fine however if your horse is caked in mud I do not provide a grooming service and may not be able to massage your horse. Massage is always more effective on warm muscles and mostly my assessment will help to warm the muscles up. 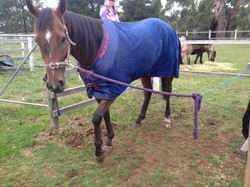 If it is a cold day and your horses is wearing a rug, leave it on until I get there, I am happy to help rug and unrug your horse. You (or a capable horse handler) will need to be in attendance for the duration of the massage, there are many reasons for this, I may have questions for you, you may have questions for me. It also a safety issue for me and the horse and if at any time I do not feel safe I reserve the right to cancel the massage service at any point for safety reasons. If the massage is cancelled for safety reasons you may be required to pay travel costs only. I attempt to plan my day to fit in as many people as possible and in a sequential travel plan so as to keep travel costs to a minimum. If for some reason you need to cancel your massage appointment I appreciate at least 24 hours notice. There are occasions where I may need to cancel appointments and this may be due to but not limited to weather conditions and other factors outside my control. Where appointments are cancelled I will do my utmost to reschedule your appointment to the next available mutually convenient time.